My friends and I were avid cross-country skiers living in the Margaree Valley on beautiful Cape Breton Island on the north end of Nova Scotia. Being situated on the western shore of the Northumberland Strait we were dumped on by plenty of snow throughout the winter. Winds would pick up moisture from the Strait, cooling it as it climbed over the mountains and releasing it into our valley. We had fantastic ski conditions most of the time. Our enthusiasm for the outdoors grew to a passion as groups of us would ski along the river and the hills surrounding our little paradise. An exhausting climb up the east side of the valley (1,500 feet up) brought you to the area called the Cape Breton Highlands. 800 square miles of forest with a few access roads used by the pulp company who logged it in summer. There is nothing but trees, lakes and wildlife to see. In summer a few folks would travel the area to fish the lakes, but in winter it became a heaven for snowmobilers. 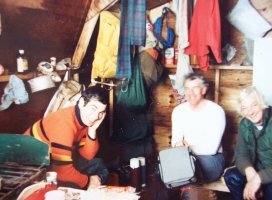 Three of us decided to travel to our small camp in the highlands for some skiing. Bill and Obie would take snowmobiles with all of our gear and I would ski the 9 miles to the camp. They went on ahead while I climbed slowly up the trail leaving our beautiful valley behind. Reaching the summit, I discovered the beautiful fluffy snow that had fallen previously had blown away into the woods by strong winds leaving the deep snow cover with an icy crust behind. Cross country skis don’t work on ice. Mine had to. The wind was howling and the temperature was steady at -35C. I had no choice but to press on. After a couple of miles it began to snow. I soon hit the main road, turned north and another couple of miles now in blinding snow arrived at a tiny hut. It stored fire gear in summer but was empty now. Inside it was pitch black. No windows. I wanted to eat my sardine sandwich but it was frozen solid. No water. With 3 miles to go I set out. A small creek lie ahead, frozen of course. A few feet to the side stood a mysterious Canadian Lynx. I wondered what it was thinking. Hardly anyone ever visit’s the highlands except on snowmobiles so the Lynx has little fear of man. They have huge paws to get about easily on snow. They feed almost exclusively on snowshoe hares. In winter their fur coat turns almost white with only a very light sprinkling of gray hairs. The route to our hut was downhill and covered with ice. I fell as I tried to control my icy descent splitting my pants wide open. Pushing on I arrived at the hut. My buddies had a fire going. 80 square feet of living space. For three guys. We slept on the floor. Everything was frozen at that level. I took this photo. Just prior to the shutter going off I realized my split open pants were just that and quickly moved to cover them with the camera bag. The photo above is the result. Poor quality but there is our story. More photos and insight into this trip are here at my web site. What a great adventure.... one that's too cold for me, but fun to read. It shows that you should be ready for anything.... including photos!